Here are examples of cast drawings by freshman students at Thomas More College of Liberal Arts They study the academic method of drawing. This is a systematic drawing method that developed in the High Renaissance and can be traced back to Leonardo. The name comes from the art academies of the 16th and 17th centuries that established it. We are lucky to have the world renowned Ingbretson Studio closeby in Manchester, New Hampshire. During the spring semester, students spent each Wednesday evening (that's about 12 sessions) at the studio. This is a sacrifice of time as they received no concessions in regard to their other studies. The results are excellent, I think you'll agree. The students whose work you see are Elizabeth Rochon and Nicole Martin. Each drawing is approximately 24''x30''. I show these to For the final part of the spring semester, the students were assigned a project in which they were asked to design a church floor using traditional forms. I gave them two options. First, they could design a sanctuary floor, which must include the quincunx - four circles spinning out of a central circle. This is a geometric representation of the four Evangelists taking the Word of God, represented by the central circle, out to the four corners of the world through their gospels. Second, they could design the floor of a nave, the main body of the church, and this must employ a shape called the guilloche, which is a chain of interconnecting circles. In each case they had to follow the general design principle of ordering the space into regular orthogonal shapes and then filling in each compartment with a repeated geometric pattern. In the nave desings you can see that each has been sub-divided into a series of rectangles. I gave a selection of tradition romanesque geometric patterns for them to choose from. The students whose work you see are, from top: Nicole Martin, Augustine Kamprath, Erin Monfils, Aleth Sargent, Teresa Webster and Cecilia Black. I am going to post short series of features that display the work of the students at Thomas More College of Liberal Arts done during the course of the year. The first will be figurative art from Western illuminated manuscripts. 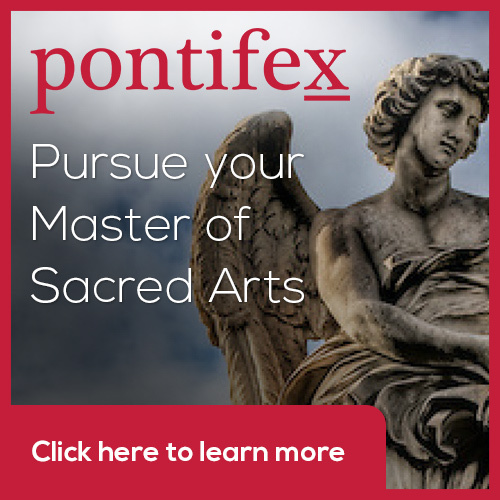 I have written before about how I think that this is something we should start to focus on in the Church in order to reestablish our traditions of sacred art. I tried it for the first time this year with the students and with, I feel, great success. The medium used is egg tempera on good quality watercolour paper. This is just the sort of work that students who attend the iconography class at the Way of Beauty Atelier, this summer can expect to be doing if they wish to. They are in the order they appear: St Christopher by Nicole Martin; St Jerome by Ian Kosko; St Maurice by Amy Green; and Daniel in the Lion's Den by Alison Trapp. Of these students Nicole Martin has had some experience of academic art classes and arrived with some skill with brush and pencil. The other, as far as I am aware are largely untrained prior to the class. Made Possible by the Generosity of Readers of this Blog. In the autumn I asked for donations towards the tuition of Thomas More College students who wished to take art classes at the internationally recognised Ingbretson Studios in Manchester, New Hampshire, which teaches the academic method of drawing and painting. The academic method has its roots in the methods developed by Masters of the High Renaissance such as Leonardo da Vinci. They are taking this training in addition to all their academic work at the college and are expected to maintain the same standard and effort in their academic work. I am pleased to say that two generous donors came forward and the money they gave helped two students to study for the semester. So on behalf of Liam Mitchell and Jaqueline Del Curto, I would like to thank you and thought I would show you the work they did during the semester. For both Jaqueline and Liam, this training is part of their career aspirations. Jaqueline wants to be and artist and Liam wishes to go into film and so this will develop his sense of how to communicate visually. They both realise that in addition to the training of the skills, they must have that grounding in philosophy and theology that will form them as individuals and enable them to understand how form communicates meaning. Accordingly they both work hard in academic and practical study towards being the new breed of ambassadors of the Faith, engaging with the world as part of the New Evangelisation. Here are examples of cast drawings by freshman students at Thomas More College of Liberal Arts. They study the academic method of drawing. This is a method that developed in the High Renaissance and can be traced back to Leonardo. The name comes from the art academies of the 16th and 17th centuries that established it. We are lucky to have the world renowned Ingbretson Studio closeby in Manchester, New Hampshire. During the spring semester, students spent each Saturday at the studio. This is a large sacrifice of time as they received no concessions in regard to their other studies. The results are excellent, I think you'll agree. The method involves setting the easel up next to the cast and then retreating several feet so that that both drawing and cast can be seen in the same angle of vision. This allows for a systematic build up of the image. The artist looks at the two, decides what aspect he needs to draw and then moves forward and draws from memory. He then retreats back to the marked position to compare his work with the cast again. Through this steady motion, moving forwards and backwards, the picture is created. The introduction to this method is through cast drawing because the plaster cast has no colour, and is stationary. This means that the student can learn to see in tonal shapes. The introduction of colour comes once modelling in tone has been mastered. You can learn the academic method at Thomas More College this summer from Henry Wingate, who studied for 5 years at the Ingbretson Studio before going on to be an internationally known portrait artist. Henry is going to be teaching at the Way of Beauty Atelier from June 27th - July 9th. For more details follow link here.